With its bright lights, celebrity speakers and beer-soaked after-parties, it’s easy to forget that HubSpot’s INBOUND conference is more than just an annual celebration of all things orange. The conference also sets the stage for HubSpot’s anticipated product announcements, which were again unveiled by VP of Product, Christopher O’Donnell. There have been big things happening at the company, especially in the back end of 2017, with some potentially game-changing acquisitions and exciting integrations. In this article, we review some of the most significant changes announced at INBOUND 2017, and unpack what HubSpot customers can expect from the platform in the year ahead. HubSpot’s product announcements don’t just mean efficiency, flexibility and possibility for its customers. They’re also telling in regards to the future direction of the company, and how they view the future direction of digital marketing. 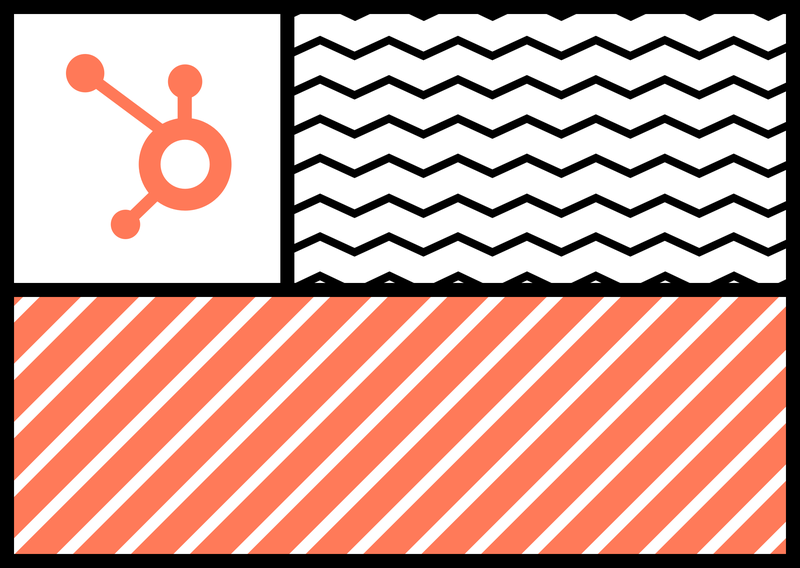 These five HubSpot announcements mean big things for platform users, and big things for the industry. 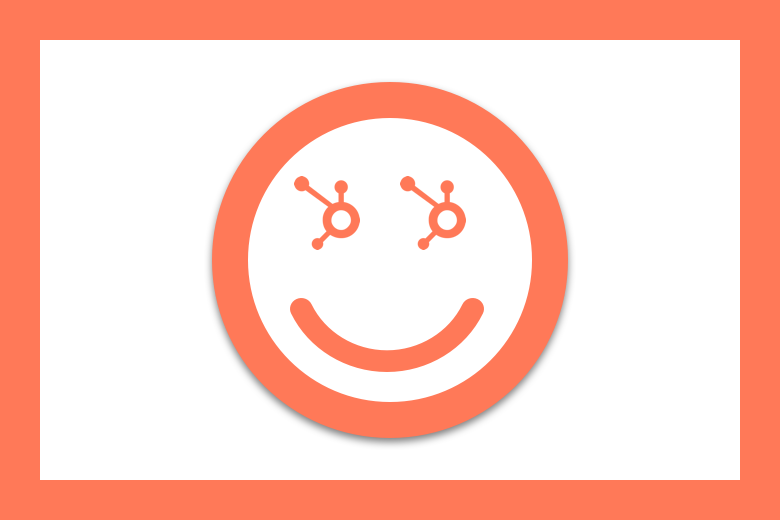 Customer success has always been central to the inbound methodology. But until now, there have been limited ways to implement at the delight stage of the customer journey from within the HubSpot platform. The Customer Hub changes that, offering a suite of tools for both marketers and salespeople to seamlessly engage with their existing customers, gather feedback and promotor insights, and escalate chats into cases. It rounds off the existing marketing hub and sales hub, which is another step for HubSpot in the direction of a truly end-to-end solution. At this stage, details of the Customer Hub’s functionality is being kept somewhat under wraps. But come its release in 2018, we can expect customer experience to move further centre-stage. You can sign up for product notifications on the Customer Hub, and also subscribe to their newly-launched Customer Success blog here. 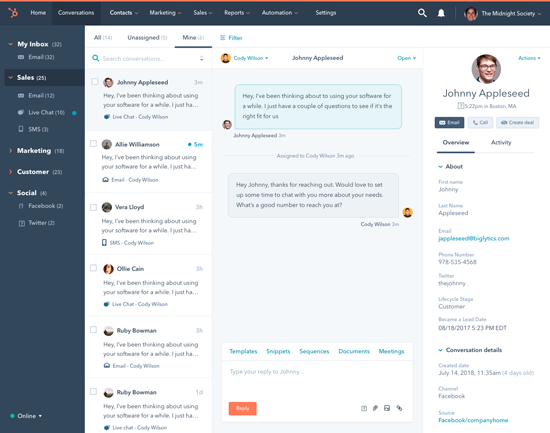 What would a customer experience platform be without a consolidated messaging inbox? 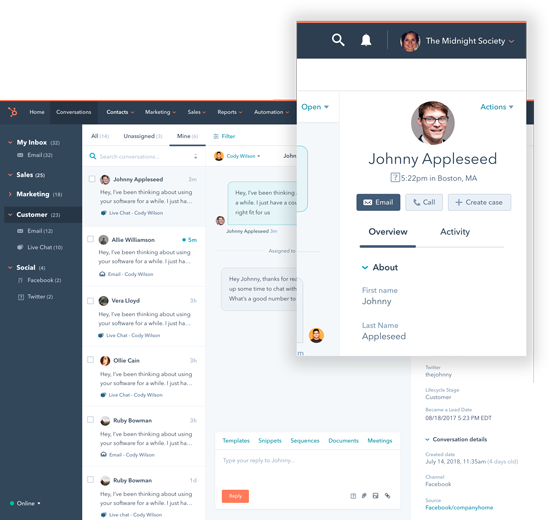 HubSpot Conversations, their answer to Intercom, functions as a shared inbox that pulls conversations from multiple messaging channel and stores them in a central location. 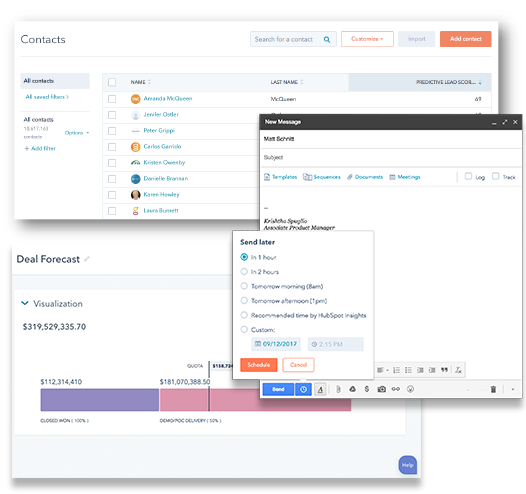 Conversations promises to be seamlessly integrated within the HubSpot CRM Free, meaning you can develop a broader picture on every contact. Even more exciting, Conversations will include automation and chatbots features, helping even small teams to scale their customer communications with ease. Organise every detail about your prospects and customers, using robust automation and management tools sophisticated teams need. Save your reps time and help them work smarter with productivity tools like meetings, templates, sequences, and a deeper inbox integration. Just days before the INBOUND conference kicked off, HubSpot released the massive news of their acquisition of Motion.AI, an industry-leading chatbot building platform for channels like SMS, Facebook Messenger, Slack and more. This acquisition isn’t necessarily surprising, given the surging volume of consumers using chat apps and growing number of brands reaching them there. Also announced at INBOUND 17, market-leading account-based marketing (ABM) software, Terminus, joins the HubSpot integrations family. HubSpot marketing users with a Terminus subscription will be able to trigger ABM campaigns based on workflow criteria, and track campaign results by target account. While not a hugely robust integration, it’s an interesting deviation from ‘pure’ inbound marketing, which was born from the idea that disruptive paid advertising wasn’t the way to win the favour of prospects. These five product announcements are far from the only exciting things happening at HubSpot in recent months. A slew of intelligent integrations, an answer to diminishing organic returns and even a name change round out our list of things to keep on your radar in the coming year. It’s official; the ‘COS’ is no more. HubSpot has ditched their often-confusing Content Optimisation System acronym in favour of the traditional CMS. In response to more stringent Google Chrome updates that began to flag non-SSL website pages that included a form as ‘not secure’, HubSpot has announced that Secure Sockets Layer (SSL) protection will be included free of charge for all Marketing Hub Basic, Professional and Enterprise customers. Adding to the collection of web clippers already available on the Chrome store, HubSpot has announced Collect - an extension that integrates with the marketing platform allowing browsers to insert text, articles, images and more straight into the blog composer. Adding to this new blog feature is a Google Docs integration, promising a seamless import process without the formatting issues that have plagued bloggers in the past. At the INBOUND 2017 Partner Day, HubSpot also announced a suite of improvements to their developer tools, much to the enthusiasm of the tech-heads in the room. Details remain patchy at this point, but stay tuned. Announced earlier this year, HubSpot’s Content Strategy tool is designed to support their topic/cluster model, which is intended to improve the organic performance of blogging activity. The method comes in response to the waning importance of keywords as a ranking factor. According to HubSpot’s product announcement, “search engines reward websites whose content is organised by topics”, citing their own success using the topic/cluster framework. HubSpot also announced a revitalised campaigns reporting tool in September, which features campaign comparisons, visual charts of impact, lists of contacts created by the campaign, contacts influenced by campaigns, and ultimate revenue generated. So that wraps up a few of the most exciting HubSpot features to watch heading into 2018.